I just posted the following over on the IBZL blog and am posting a copy here because I can (well, actually I tried the WordPress reblog but it screwed up the formatting of the photo)…. Last month, I presented a paper (written with OU colleagues Simon Bell and Adrian Jackson, and Daniel Heery of Alston Cybermoor) to PDC 2012 reporting on the IBZL project, and more specifically on the ‘Real Avatars’ and ‘Flying Shepherd’ prototypes that Daniel Heery at Alston Cybermoor followed up on with support from the Technology Strategy Board. The paper particularly highlighted two things. Firstly, we discussed how the Imagine method that we used in the workshops can be seen as a form of ‘Future Workshop’ that involved stakeholders in thinking about novel futures. The participatory design (PD) community has long been concerned with users exercising control over technological and other systems that affect their lives. In IBZL we haven’t used Imagine to engage users since we are concerned with novel ideas for whom a potential user audience has not even been defined; indeed that is one of the things we might think about in a workshop. So, Imagine is a technique for engaging people to think about the future at an earlier stage in the process than in many PD interventions. Secondly, and following on from the above, the paper reflects on who we involve. PD has its roots in Scandinavian trade unions in the 1970s, and in parts of the US civil rights movement of the 1960s, and historically at least is concerned with the politics of control of technology. While these concerns about emancipation seem rather less prominent in the PD community than they were (which personally I found disappointing about PDC2012),we used the paper to reflect on this aspect of PD in the context of IBZL. After all, the case study we reported was led by a social enterprise, and initial discussions around possible business models for a ‘flying shepherd’ owned by a co-operative of farmers were inherently mutualist. This is not a necessary outcome of the IBZL/Imagine method, but is a reflection of the sort of idea that would follow from the sort of participants we invited to the workshop. Of course, we can’t claim that this was in any sense representative, and as we work with local authorities and others who need to demonstrate a clearer democratic legitimacy for the work they do, this is likely to be an issue that will need further thought. These ideas are examined in more detailed in the paper. A draft of the paper is available here, in the OU Open Research Online. The final version is available only to those with access to the ACM Digital Library. I believe a video of my presentation will be available at some point, and I’ll post the link here. And the photo? 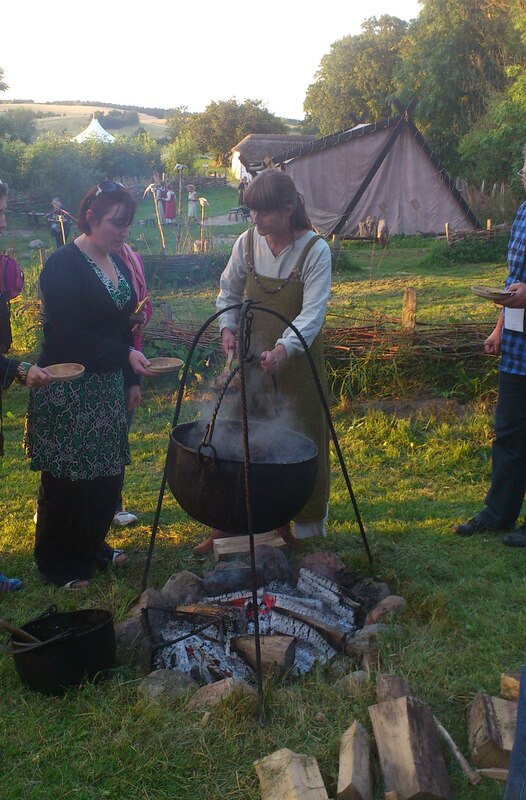 The conference dinner was held at replica Viking village to demonstrate some of Scandinavia’s communal and participatory heritage….